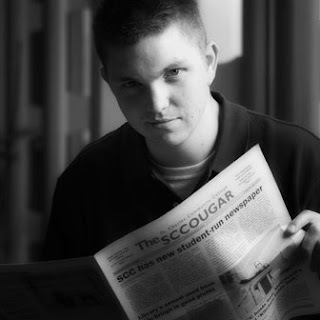 ben & beccalee, photographers: The Sccougar. 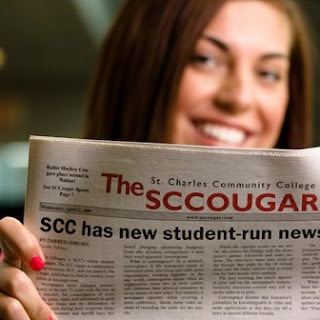 The journalism students of St. Charles Community College recently launched an online news site -- sccougar.com. And yesterday, while Amanda, Josh, Kat, and Kylie were with me on campus for the college's annual spring photo shoot, we picked up the companion print version (it's virtually everywhere on campus) and started shooting. Kind of dumb but funny. I chose to post these four because I liked their expressions. Not sure how I feel about the pub name. Oh, Who doesnt love the Sccougar.